Our existence is determined by material reality. Our consciousness, soul, and self all arise from the brain, however complex and counter-intuitive (as it often times is) the processes through which they emerge may be. As humans, this understanding of the mind is necessary if we are to squarely acknowledge our social nature. In dissecting and discovering the scientific truths that are based upon this central focus of our humanity, we come to understand the extent to which we are, in fact, our brains. This simple orientation in the context of cultural and philosophical knowledge is perhaps controversial and brow-raising. However, with the emergence of modern neuroscience we have a plethora of new tools with unprecedented accuracy that have aided us a great deal in elucidating these existential questions. In short, there are many precious truths that must be evaluated soberly if we are to continue our existence as an educated conscious organism. “The ultimate consciousness product occurs from those numerous brain sites at the same time and not in one site in particular, much as the performance of a symphonic piece does not come from the work of a single musician or even from a whole section of an orchestra. The oddest thing about the upper reaches of a consciousness performance is the conspicuous absence of a conductor before the performance begins, although, as the performance unfolds, a conductor comes into being. For all intents and purposes, a conductor is now leading the orchestra, although the performance has created the conductor—the self—not the other way around. The conductor is cobbled together by feelings and by a narrative brain device, although this fact does not make the conductor undeniably exists in our minds, and nothing is gained by dismissing it as an illusion”(Damasio). Instead of a mystical soul with a mystical fate in the afterlife, there actually exists a complex universe of synapses connecting billions of neurons that communicate with each other in a complicated “language” which neuroscience seeks to decode. We now understand how individual neurons communicate, how they organize, sites which have specialized purposes, each essential to our conscious existence. How something as complex as you, the reader, comes from the product of 100 billion cells cobbled together within your skull may be unsettling to think about. In fact, most react to this seemingly cold and machine-like worldview with immediate distaste, instead holding fast to some unexplainable soul-like entity. Regardless of these expressions of existential angst, there is a direct material connection between your experienced self and what your brain is. No scientist today claims to have illuminated the secrets of the mind in its entirety (and many doubt that we ever will), despite the immense amount of neurological knowledge that has been uncovered since accepting a determinist outlook. This knowledge based upon a determinist worldview will continue to accumulate whether or not people choose to accept the truth inherit in each succeeding experiment and discovery. As our planet continues to face never before seen problems based upon the human density of our modern civilization it becomes more and more imperative that we deepen our understanding of humanity rather than satisfy ourselves with a stagnating mysticism. Ethically speaking, when will it be more of a social detriment to our communities to turn away from materialist knowledge than to reject it? How many emotional abuses must be tolerated and endured by skeptical individuals before people look for new explanations of their suffering, their missteps, and the injustices that surround them? Determinism is directly counterposed to “idealism” and other ideologies that conflate mental events with an almost supernatural causative nature. The idealistic rationalizations of our existence, which have been created and reproduced by the cultures of past generations, have thrived in the absence of a scientific analysis of the human brain. Despite the genius inherent in the beauty of these spiritual explanations, they still miss the mark in identifying the true underlying causes of our magical existence. Now that we as a species are faced with more crises than ever before, situated within violence of an astronomical magnitude, it is urgent that we identify and deconstruct the antecedents of these evils. How can we truly isolate these violent variables if we do not understand ourselves and the processes through which we discover our own world? It is no longer sufficient to rationalize our suffering through invisible entities. We do not deserve the pain that is inflicted upon us by our fellow humans any more than we deserve to be limited by a system wherein we are allotted our successes by some superhuman agent. If we content ourselves with these elaborate immaterial narratives which seem to justify our behaviors in a difficult world, we will not make progress in removing that which make our lives difficult. Despite the cathartic effect spiritual explanations have on individual behaviors, the entities that are created to accomplish these subjective experiences are nonetheless immaterial and invalid understandings of our universe. This is more apparent now that we have the ability to identify the structures in the brain that allow for these spiritual delusions to sate our existential angst. Posed differently, our scientifically accurate understandings of the brain also explain how our brains have created the inaccurate perspectives that have served less-informed generations of the past. To move forward, we must allow scientific discovery to imbue itself with our social rhetoric, thus enriching our logic further. This process of rediscovery and re-evaluation is essential to our education as a society because it clears away many obstacles that have previously obscured the truths neuroscience is beginning to reveal. In embracing a determinist understanding of the world we gift ourselves a standard with which to evaluate the cultural knowledge we have accumulated as a species, discarding problematic inaccuracies while also embracing more humanizing accuracies expressed through the wisdom of our ancestors. Perhaps more importantly, with this standard we as a society can re-examine the ethical nature of our social structures and build new systems of sociocultural regulation wherever we find shortcomings in our current political systems. Determinism is relevant because it enables us to focus upon social variables that affect our behaviors. In addition to social behaviors, our environment also shapes the structures and social roles with which we socialize others. I argue that under capitalism, the structures and roles we see most modeled in society are based upon the accumulation of capital, as its title implies. In this environmental niche we see behaviors which best win capital rise to the top of the capital hierarchy. In reproducing these behaviors through different means of socialization—the educational system, the media, the armed state, religious institutions, banks, corporations, and political parties—society provides strategies for its individuals to aim towards in order to best survive. Recognizing those behaviors that are beneficial for our survival is a significant ability the human mind has attained during its evolutionary history. This tendency towards capital-winning behaviors, which are vehemently encouraged under capitalism, promotes destructive structural assimilation towards capital as a social motivator. “But in addition to the logic imposed by the unfolding of events in the reality external to the brain—a logical arrangement that the naturally selected circuitry of our brains foreshadows from the very early stages of development—the images in our minds are given more or less saliency in the mental stream according to their value for the individual. And where does that value come from? It comes from the original set of dispositions that orients our life regulation, as well as from the valuations that all images we have gradually acquired in our experience have been accorded, based on the original set of value dispositions during our past history. In other words, minds are not just about images entering their own procession naturally. They are about the cinema-like editing choices that our pervasive system of biological value has promoted. The mind procession is not about first come, first served. It is about value stamped selections inserted in a logical frame over time”(Damasio). And what environment better demands that out brains make “value stamped selections” than capitalism? We might assume that our “selections” are made exclusively by ourselves, from within our individual selves. Yet, in examining the causal entities which create social symbols—money, commodities, privilege, and authority—that express a particular value, we realize that we are merely reacting to a social landscape which has been presented to us by persons of power. Expressed differently, we live under conditions set by the class that rules us, i.e. the Bourgeoisie. In understanding how our emotions sufficiently motivate our actions and decisions, we recognize how behaviors are directed towards objects and rituals that have value relative to other environmental stimuli. This “value,” however, is not necessarily dictated by some abstract concept that is inherently beneficial to the human body and mind. “Hence, when we bring the products of our labour into relation with each other as values, it is not because we see in these articles the material receptacles of homogeneous human labour. Quite the contrary : whenever, by an exchange, we equate as values our different products, by that very act, we also equate, as human labour, the different kinds of labour expended upon them. We are not aware of this, nevertheless we do it. Value, therefore, does not stalk about with a label describing what it is. It is value, rather, that converts every product into a social hieroglyphic. Later on, we try to decipher the hieroglyphic, to get behind the secret of our own social products; for to stamp an object of utility as a value, is just as much a social product as language”(Marx). This much is apparent when we evaluate the variation in how value is subscribed to similar behaviors and objects across different cultures. Subtle behaviors of gratitude in one culture might arouse disgust in another. On a smaller scale, we see how our propensity to recognize value is easily abused when we evaluate the amount of addictive behaviors that have become more and more prevalent in our modern society. More importantly, much of “value” is defined and dictated by those who own the means of production which materially motivate and socialize the people who are directly affected by what is produced. This is true because of the basic prerequisite of capitalism; that people use money in the exchange of commodities—food, clothing, shelter, luxuries, electronics, and even labor. What is produced is dictated almost exclusively by what is determined to be profitable by these owners, i.e. the bourgeoisie. In a country based upon urban sprawl, industrial means of transportation are necessary to maintain a job. Living in the information era necessitates commodities that receive and send information—cell phones, computers, and fax machines. Following this apparent observation, one can easily see how our social hieroglyphics are oriented around framing the necessities of life such that they become commodities, thus compelling us to work for capital; our lifeblood under capitalism. Regardless of the personal value each of these items has for an individual, a price still remains. The working class, which has nothing to sell but its own labor, acquires objects and services by purchasing them. Each necessary purchase in a worker’s immediate future represents a ritual, a series of eight-hour shifts, that end in the right to own a commodity. The inequities that result from the exploitation of this dependence on the bourgeoisie’s ability to “offer” jobs are as numerous as the number of workers who make up a population’s workforce. “A commodity is therefore a mysterious thing, simply because in it the social character of men’s labour appears to them an objective character stamped upon the product of that labour; because the relation of the producers to the sum total of their own labour is presented to them as a social relation, existing not between themselves, but between the products of their labour. This is the reason why the products of labor become commodities, social things whose qualities are at the same time perceptible and imperceptible by the senses…There, the existence of the things [through] commodities and the value-relation between the products of labour which stamps properties and with the material relations arising therefrom. There it is a definite social relation between men, that assumes, in their eyes, the fantastic form of a relationship between things…[It is] Fetishism which attaches itself to the products of labour, so soon as they are produced as commodities, and which is therefore inseparable from the production of commodities” (Marx). Here we see, by the very fact that we are now dependent upon the consumption of commodities, we engage in social decisions that do not take into consideration the well being of the people directly involved in creating the object before us in the market. The basic contradiction we find ourselves continually running up against is the fundamental irreconcilability between the workers of the world who labor for the most minuscule of wages, which are necessarily too small to compete in the free market in the illusory manner we are socialized to accept as a truly “equal opportunity,” against the bourgeoisie who accumulate capital from exploiting generations of labor. Such an illusion, nefarious in its very nature, is an excuse for the condemnation of workers to a lifetime of poverty. The magnitude of capital owned and circulated by the ruling class exists because of the means through which profit is usurped by the bourgeoisie in the labor market. This market is where workers sell their labor at a value predetermined by capitalists who calculate the cost of paying wages in direct relation to the profit he or she expropriates from the worker. This is the fundamental problem with capitalistic production; it requires the existence of a class of people who are exploited for the purpose of producing more capital to be expropriated by the ruling class. This process includes the supposed “middle class” who exist on the periphery of direct class exploitation. The “middle class” or petty-bourgeoisie exist in as much wealth as the bourgeoisie allows. Regardless of the amount of wealth a member of the petty-bourgeoisie has managed to accumulate, their money pales in comparison with the wealth of the true bourgeoisie who not only have astronomical amounts of capital in the market but also, as a requirement of capitalistic production, super large populations of people who labor under their rule for a small portion of the capital (i.e. wages) originally advanced by the wealthiest of the bourgeoisie. Despite the fact that the American dream/illusion appears more vibrant for this “middle class,” it still remains an illusion because they will always command less capital than the bourgeoisie. In addition to this fact, the capital they are allowed to have is necessarily composed of capital already set into motion by capitalists before a petty-bourgeois business can set into motion its own small pool of capital in the market. It is also important to note that the small business owner’s money returns to the hands of capitalists as soon as he or she spends their capital in the market on commodities. Fear may be nothing but a false alarm induced by a culture gone awry. In those instances, rather than saving your life, fear is an agent of stress, and stress over time destroys life, mentally and physically. The upheaval has negative consequences (Damasio). “Emotions are complex, largely automated programs of actions concocted by evolution. The actions are complemented by a cognitive program that includes certain ideas and modes of cognition, but the world of emotions is largely one of actions carried out in our bodies, from facial expressions and postures to changes in viscera and internal milieu” (Damasio). This means that the circumstances in which an individual’s emotions/feelings are aroused reflect within them an individual narrative that expresses their own subjective experiences. Capitalism situates these emotional mechanisms in an environment of extreme stress and ultimatums, which demand our submission. Thus an important task of our narratives is to rationalize our social submission. Narratives are constructed by each person’s own self, a lifelong stream of memories bound to one body, which lives because of successful life regulation techniques learned by the core self. Simply put, we must work as wage slaves under capitalism if we wish to continue living, and our brains have the capacity to internalize this implicitly and explicitly. Under capitalism, which is constructed of inherently stressful oppressive structures focused upon irrational accumulation of capital, all people who are socialized within its body adopt (at least for a time) a narrative casting each individual as the protagonist. This protagonist rationalizes all of his or her decisions in a hostile environment as necessary. In the worst cases we see people who feel entitled to act in ways which are oppressive to others simply to justify the crude daily decisions that must be made in order to survive under capitalism. Regardless of whether or not this external process of motivation is subjectively understood, objective reality shows us that human reward circuits drive us to survive in our hostile environment by adapting, or assimilating, to the social roles that capitalists most desire from their subordinates in their hierarchical order for Capital. Marx deconstructs Capitalism to its most basic parts. He defines wage slavery as the fundamental social contract to which we all agree. “What does it mean to sell your labor power to a boss? …behind this purely formal and legal contractual relation—you sell your labor power, part of your time, to another, for money to live on—is in reality something of deepgoing consequence for all human existence and particularly for the life of the wage laborer. It first of all implies that you lose control over a large part of your waking hours. All the time which you have sold to the employer belongs to him, not to you. You are not free to do what you want at work. It is the employer who dictates what you will and will not do during this whole time. He will dictate what you produce, how you produce it, where you produce it. He will be master over your activity”(Mandel & Novack). So it stands to reason that our own individual narratives of purpose, of existence, have embedded within them a certain existential defeat. I believe that we carry within our selves, either unconsciously or consciously, an understanding of this fundamental sacrifice. We search for affirmation of the necessity of the many sacrifices we make out of reverence for the might of capital and the state that defends it. Hierarchy removes the agency working class people utilize from the sphere of social production. It replaces personal agency with subordination to a hierarchical structure that is both non-democratic and is based upon the flow of capital. This structure bases itself upon the social roles that are decidedly more favorable for the accumulation of capital. Each of these roles embodies a surface narrative combining authority, status, and privilege for the purpose of subordinating individuals (or other “subordinates) who make up the foundation of a hierarchical structure. Necessarily, it is true that by adopting these prescribed social roles workers accept their poverty and the comparative wealth of society. This is because the workers, who live within society at gunpoint, accept their wages and the violent terms that come with them. Because the capital hierarchy is dominated by men, and its legacy is founded upon the oppressive subjugation of women for the purpose of creating private property, it follows that the social roles and narratives that patriarchy has culturally reproduced throughout history do not allow for true gender equality. Specifically, by adopting certain stereotypical gender roles (which are incongruous with less accepted/familiar gender identities) the oppressed reproduce oppressive “gendered” behaviors, which permeate profoundly into sexual relations and agreements. Capitalism sets the accumulation of capital as the primary idealistic aspiration for the people trapped within its historical rule, thus resigning its most proud aesthetic to the likes of immaterial spiritual worship. 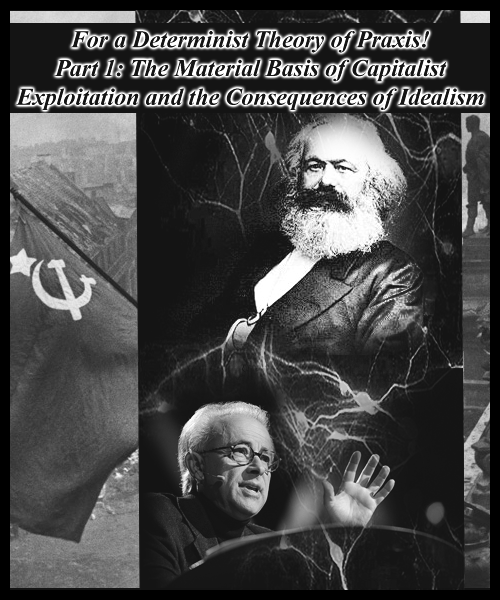 This material condition of Capitalism necessitates a new environment, which in turn encourages a new revolutionary aesthetic founded upon scientifically based re-education that can equip the minds of this modern generation more properly so that they may better evaluate the complex environment in which they live. Fantastic post, I agree completely with your points about the advent of a new understanding of human nature, and the unduly abstracted value system we are all forced to subscribe to. I’d like to dig into one point a bit, in response to the Mandel & Novack quote, “What does it mean to sell your labor power to a boss?” – Are the authors digging too deep? From their formulation of the problem, I’d posit that the underlying issue is lack of choice on the part of labor, not the fact the time is exchanged for money. What if every laborer, even the most menial, had access to the same standard of living as a doctor or a lawyer? (This includes leisure time, a high enough salary to afford anything one could reasonably desire, professional freedom, social deference for the worker, etc). This is a reality brought about by competition between the bourgeoisie for labor, and it is precisely the long term trend in a technological, loosely controlled economy: the movement of the lower class to the middle class, and the transfer of (the most dehumanizing) jobs from the lower class to machines. In a world subject to this trend there would still exist a gap between the wealth accumulated by the middle class and the bourgeoisie, but the gap would not only be ever-shrinking, it would be practically irrelevant given the high standard by which the masses lived. I do not believe their analysis is too deep. I believe this is their way of looking at this unfortunate condition of capitalism is humanizing in that they understand the real consequences of capitalist employment. It is not, on the contrary, an removed and abstract suggestion for employed workers. It is easy to tell the oppressed to keep faith in the reformability of an exploitive system when one does not struggle alongside them.